It would be nice to see Steve back posting ,I know he has allot to do with his community , on a few committee's that used to take up allot of his free time . I wonder how his lathe project is going . Sorry to have been away so long -- we are still without water, and I worked all summer long on building the cistern. I never did get help with it and completing the armature, and plastering took tremendous amounts of time. The lack of water also made mixing and cleaning up hard, and unusually hot and dry conditions made applying the cement plaster and keeping it from slumping, or drying and cracking difficult. In all I mixed and applied over 100 small wheel barrow loads of render. About 6000 pounds applied. Final capacity is about 3000 gallons, but of course we have nothing to fill it with (yet). It so happens it's raining today, but the prediction is for about 1/10th inch -- pretty typical this whole summer and fall. Our worries are that the water won't come back in our spring-well until the pipes (about 300 feet from the house and uphill) freeze -- which would be an additional problem. Anyway, it is raining, which I'm grateful for, even if a small amount. 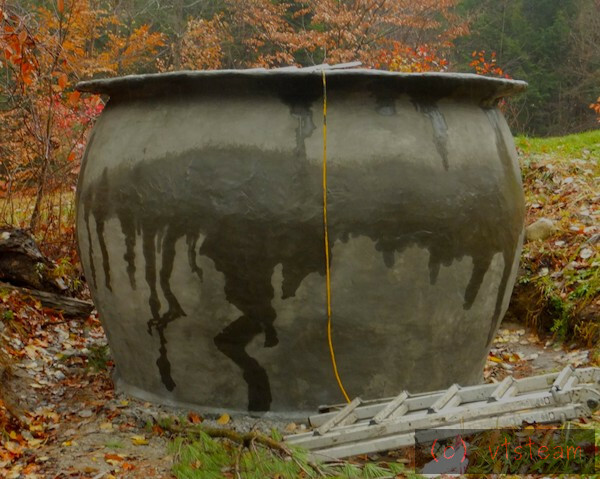 The cistern is substantially finished, with the exception of forming the lip more aesthetically, and plantings, small stone wall and pool, and permanently plumbing to the spring. All that will be postponed until after the winter. Missed you guys. I'll try to keep up better! I commiserate with you about your drought (no such problems here in the UK at present!). But looking past your cistern, you seem to have some good-looking Autumn colours. Steve, very good to hear that you are back with us. great to see you back. Did you model it on a Harry Potter cauldron, or is that just my mind??? Seriously though that's a hell of a lot of concrete and even more back breaking plastering no doubt. Sorry to hear you're suffering a drought. We could lend you a lot currently but at least it kept bonfire night celebrations from running out of control. "small stone wall and pool" sounds aesthetically very nice but practically a lot more work. Couldn't "strategic tree planting" suffice? Possibly walnut trees so you can enjoy the "fruits of your labours" or Hazel nuts grow quick and taste good? At about 1500 gallons a day flowing thorugh. I filled the "waterball," as we call it for the first time a week a go. Still need to do more -- the wheelbarrow isn't an ideal fountain catch basin, and the pvc pipe outlet isn't the most aesthetic fountainhead, but at least there's the security of knowing we have a 3000 gallon reserve now. Naturally, it's turned in to a very wet spring! Can't even turn over the garden yet, because it looks like a swamp. When it rains it pours as they say! good to have contact back. Possibly a small statue plumbed to look like a modder relieving him / her self might put the neighbours off from borrowing water??? Ian it would put us off as well! Might just be an arch. Just re-reading the title to this thread, very apt! Not only did it take up almost the entire summer, but my workshop is practically destroyed from emergency mode waterball construction, and then winter lockup. Masonry tools, and supplies covering the floor and workbench of the tiny shop -- I can barely get in the door. Moisture seepage from the wet early spring weather and snow melt. I know there is my old lathe project buried under there somewhere, rusted from cement dust. Not to mention mouse crap -- they got into my tool cabinet, too. I'm afraid to look. But we'll attack all in the coming weeks and try to get back to where normal life left off. I should probably consider the lathe a restoration project, instead of new construction at this point! Happy to have you back. How is everybody? .... I know there is my old lathe project buried under there somewhere, rusted from cement dust. Not to mention mouse crap -- they got into my tool cabinet, too. I'm afraid to look. Restoration? Sounds more like rescue operation. But first ting firs, this is (mostly) hobby and there are priorities. My figh against moderate flood (the water is 5 m away rom our house and it has 5" upphill before it could cause real trouble) and alternating snow fall and ants that try to inavade inside sounds pretty tame in comparison. Keep the spirit up and enjoy any improvemet you do. Thanks Pekka! It will probably be a week before I start clearing up the workshops. Right now I'm helping my in-laws move into a house about 15 miles away -- they moved here from Boston to be closer to us. That will probably use up a lot of this week. They had been in their old house for 49 years. You should take all necessary precautions immediately. Also well worth spying out the local area near the house for broom stick landing areas, then more cloves in the nearest trees. Course the father in law will need support and might even help in the workshop, which should be encouraged as your " spending time with YOUR father dear, encouraging him to relax". Even better if he comes with you to buy essential supplies, you will not believe what you can get away with using that approach!!! On a serious note hope all goes well. Well, I found a woodchuck had burrowed into my big storage area (supposed to be a shop) and wrecked lots of things by covering them with dirt. Undermined the concrete pad covering half of it. the tiny shop is doing better now, however, I can get into it and it is approaching some form of organization. Just the reverse on the in-laws, Ian. Mother in law is a sweetheart. Father in law's reaction to machining projects in the past has been, "what do you want to do that for?" In unloading the moving van into his new house he criticized the fact that I was moving some heavy trunks with a dolly. He felt I should just carry them through the basement. If I try talking to him about something I'm interested in (instead of listening to him talk about the price of his phone service for 20 minutes) he will often just turn and walk away in the middle of a sentence. I haven't heard a word of praise from the man in the 22 years since I met him. I've learned to just shrug it off. Funny, I feel sorry for the guy. What's a woodchuck?? My wood chuck holds platters and goblets on the lathe?? Why not,let father in law demonstrate how easy it is to carry the stuff and you watch instead? Never mind, you,can get on with your stuff now!
" How much wood could a Woodchuck chuck if a Woodchuck could chuck wood "
Woodchucks and groundhogs are the same animal, just regional names. The funniest name for them is whistle pigs! They whistle a very loud warning chirp if they see a person -- usually long before you see them. They're cute if they are not undermining your foundation, or destroying your garden overnight, or your cows aren't breaking their legs in the burrows. But mice and rabbits are cute, too. Woodchuck populations can explode if there aren't enough predators around to control them, and then they become a problem. They are supposed to be good to eat. "The gardener who created this dish notes that the herbs and vegetables in this recipe are available fresh from the garden because they have not been eaten by the dish’s main ingredient." "Have someone else clean your freshly killed groundhog." Which I think sounds like good advice for the potential whistle pig epicure. Vermonter's who live back in the woods are also affectionately called woodchucks. Coincidentally, speaking of the wild, there were bear prints in the garden this morning. I haven't planted anything yet because we've had so much rain, I can't even till it. But the mud preserved the footprints. I just poured some plaster of Paris in them while my daughter is away, so when she gets back home in a few minutes she can pull the casts out and see what they look like. We've got lots of politicians roaming wild currently. Bears are positively polite by comparison Andrew ! Can anyone tell me when the season starts? The casting. There's been a big increase in the black bear population in New England over the last decade. Something like 6000+ in my small state, and Maine has 30,000, I believe. Even tiny Rhode Island has seen them return from extinction there.